Shredded Ralston Dumb Dora Ad 1940 This is an April 9, 1940 advertisement. It is a nice color cartoon fashion ad from shredded Ralston. Pictures the father in the kitchen with everything in the mix, he is fixing a mega vitamin breakfast, while Dora and son Richey wait. When it is cooked, no one can eat it and they dine on Shredded Ralston. Breakfast fit for a king. In mint condition. Photo is taken through plastic and may show wrinkles or crookedness that is not in the ad. This magazine tear sheet measures 10 1/4"" wide by 13 1/2"" tall. 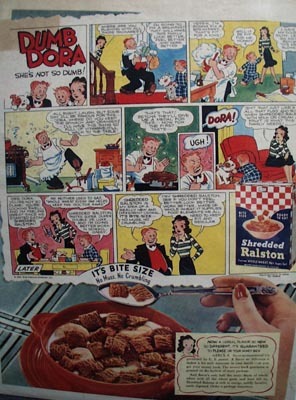 Items Similar To "Shredded Ralston Dumb Dora Ad 1940"